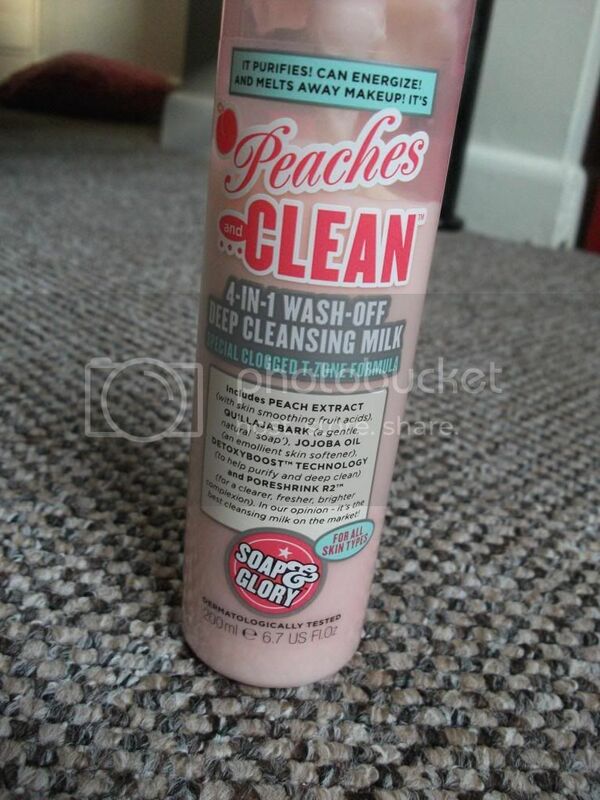 Peaches & Clean was one of the items in the Soap & Glory Best of All set I bought before Christmas, and I mentioned at the time it was one I was really looking forward to trying. This comes in a clear pink plastic bottle with a pump-action top making for easy, hygienic dispensing. It also means it's super easy to see how much there is left - always useful, since you don't want to suddenly find you've run out! I also really like that the pump can be "locked" - meaning no messy explosions when travelling! According to Soap & Glory, this is something of a wonder-product, including peach extract which contains fruit extracts to soften the skin, whilst quillija bark acts as a natural "soap", and jojoba oil is a skin-softening emollient. Additionally, Detoxyboost™ helps purify and deep-clean, and Poreshrink R2™ clears, freshens, and brightens the complexion. Peaches & Clean also claims to have a "special clogged T-Zone formula", which is definitely me, so I was really looking forward to seeing what this could do for my skin. Peaches & Clean dispenses as a soft, pale pink-coloured milk with, as you might expect, a gorgeous peachy scent - it smells exactly like a tin of peaches, it is so lovely to use. I find I need three or four pumps of an evening to remove all my make-up, but in the morning just one or two is plenty to freshen my skin up. I start at my cheeks and gently massage into the skin for a minute or so, spreading the milk around over my nose, chin, jaw, and forehead. It melts into the skin as you rub, dissolving your make-up as you go. I'm often naughty and use this around the eye area, and I've found it removed eye make-up including mascara pretty easily and without making my eyes sting. Once I've massaged it in thoroughly, I remove it using a muslin cloth or face cloth, soaked in hot water. I tend to repeat this a couple of times to be sure that I've removed all traces of dirt, make-up and cleanser, and then I apply moisturiser. 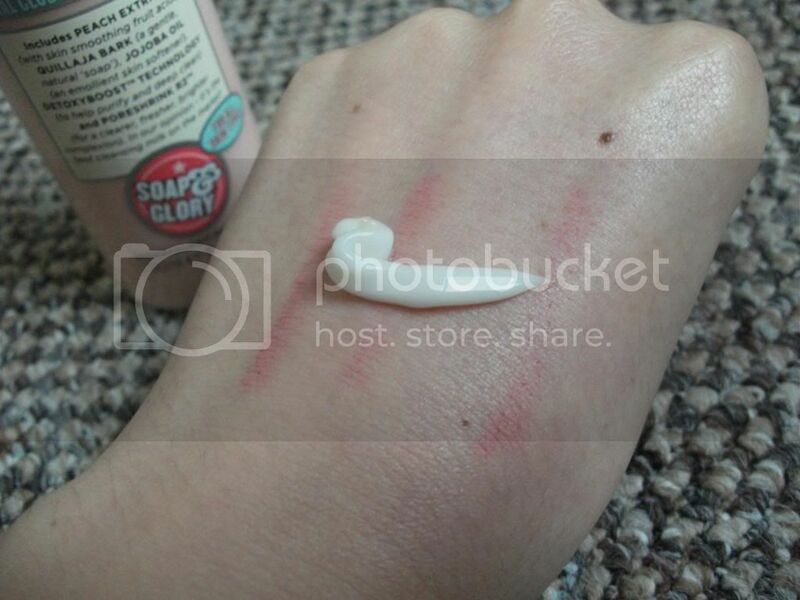 I feel this does a really good job of removing my make-up (the lipstick swatches on my hand in the photo above were totally gone when I washed this off!) and my skin is left feeling soft and smelling lovely after using it. I haven't noticed any reduction in the clogged pores in my t-zone, however, and I'm not sure if the scent is maybe a bit much for my sensitive skin - I have been suffering a few spots since I started using this. I probably won't repurchase, although I'd happily use it again should it show up in a gift set or anything like that. I just feel that the nSpa Hot Cloth Polish was much more suited to my skin. I also found that the pump broke towards the end of the bottle, meaning there was an inch or so of product in the bottom that I couldn't use - sad times! Peaches & Clean retails at £7 for 200ml and is available from Boots. 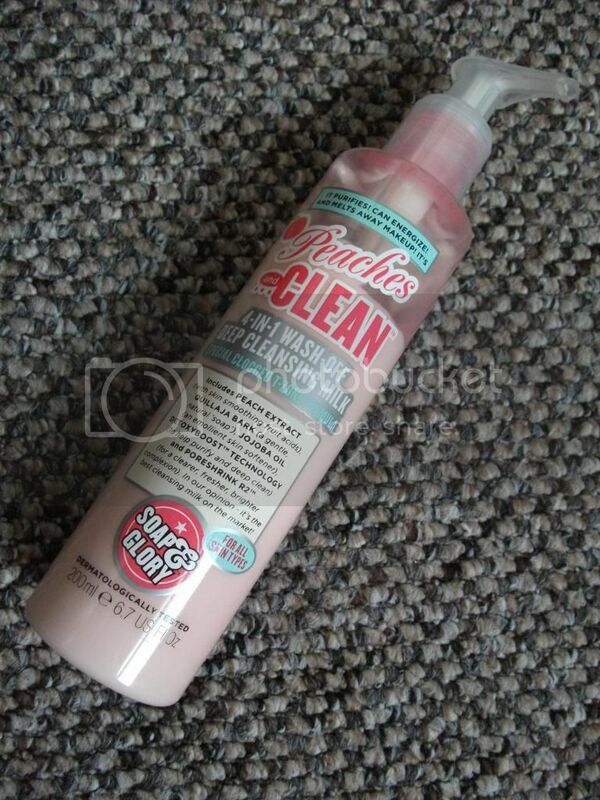 Have you tried any of Soap & Glory's cleansers? Which is your favourite? I really want to try their Fab Pore Hot Cloth Cleanser! I love this and use it every day.